A two player game where the key to survival lies in the hands of the other player. One player plays on the keyboard and is responsible for destroying the viruses and gaining material for the other player. 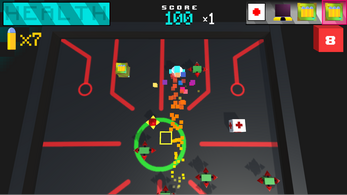 The second player plays on the mouse and helps the other player by dropping different crates that provide health, bullets, or protection.